Workman Publishing Company, 9781523507948, 96pp. 1778. Long Island, New York. The town of Setauket is under siege, occupied by an army of British redcoats. A whisper network develops among American patriots. Secret letters are hidden in boots. And, by a house on a hill, handkerchiefs flap on a clothing line. Their significance is greater than meets the eye. . . . 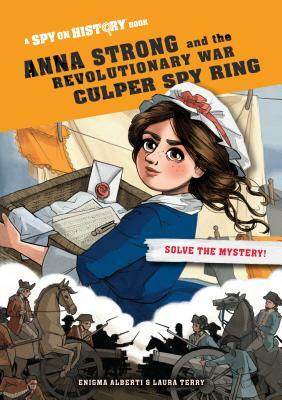 In a story of intrigue and danger, Anna Strong and the Revolutionary War Culper Spy Ring pulls young readers into a little-known chapter of the American Revolution, when George Washington’s group of spies—known as the Culper Ring—became a deciding factor in the fate of the American nation. Leading this cast of fascinating (and real!) spies is the indefatigable Anna Strong, who communicated intelligence to Revolutionary leaders by hanging white handkerchiefs on her clothesline, among other ingenious spy tools. Being unfairly underestimated as a woman turned out to be a surprising asset: It meant that Strong managed to pass by right under the eyes of the redcoats, unsuspected of being a conspirator. But it also meant she was all but erased from memory of the Culper Ring’s legacy. Spy on History sheds light on her role in our nation’s founding, introducing middle grade readers to a brave hero. Along the way, readers will encounter a mystery of their own, unraveling clues embedded in the text and illustrations to make sense of a final letter from Anna Strong. This hardcover library edition does not include any removable spycraft materials, which are included in the paperback edition. Enigma Alberti is the nom de plume of a secret cadre of authors who are each writing a book in the Spy on History series.